Thick, Heavy Pieces - Genuine pieces are generally very fine and delicate in comparison to reproductions, which are sometimes so heavy they resemble pottery more than porcelain. Crazing - Some reproductions exhibit crazing in the inferior glaze. Crazing is rarely present on authentic R.S. Prussia items. Heavy Transfer Decor - The elements decorating original R.S. Prussia pieces were usually very finely done, even when transferred rather than hand painted. Reproduction transfers are oftentimes heavy-looking and sparse in comparison to the intricate decor of genuine pieces. Bogus Marks - Marks on these fakes range from a wreath with the letters R.S. without Prussia below, to those that are simply off color and contain too much red. Others look fairly close to the original R.S. Prussia mark, so it's wise to look at the characteristics of a piece in addition to the mark when determining the authenticity of a piece. This is one of many bogus marks found on R.S. 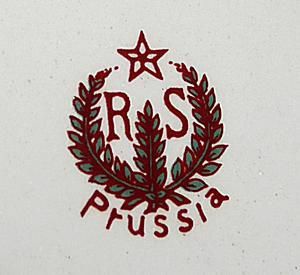 Prussia porcelain reproductions. Read more about it below. This fake mark is found on many different types of R.S. Prussia reproductions including the chamber pot and bowl depicted in photos two and three of this gallery. The distinguishing characteristics are the thickness of the lines making up the mark and the amount of red used in the coloration. Although avid collectors will easily note this as a fake mark, novice collectors may not be as sure and should examine an item in its entirety for other clues if they are not sure about a mark's authenticity. The best way to distinguish this mark as a fake is to compare it to a genuine version of what collectors refer to as an R.S. Prussia "red" mark. This R.S. Prussia set has been seen in pink and blue with other floral decor in addition to the beige example with daisies shown here. This set bears the reproduction mark that closely copies the shape of the authentic RSP "red" mark. The ceramic material used in this set is much heavier than authentic R.S. Prussia porcelain as well. This lidded chamber pot is not authentic R.S. Prussia in spite of the mark on the bottom describing it as such. See more information on this item below. The quality is off on this piece when compared to genuine R.S. Prussia items. It is heavier in weight, and far less delicate in terms of the mold shape and decorative techniques used (in this instance transfer designs that have a "new" look to them). It is also marked with a fake mark that is heavier and includes redder than an authentic R.S. Prussia mark. Technically this could be deemed a fake because it doesn't clearly mimic an original R.S. Prussia piece. Most collectors and dealers refer to these pieces as reproductions nonetheless. This R.S. Prussia reproduction bowl is an obvious fake to the seasoned collector. Read more about it below. Holding this heavy bowl it's easy to assess that the quality isn't up to par. The porcelain is thick and clunky (almost like pottery rather than porcelain), and it is heavily crazed. The transfer decorations are not delicate like those found in genuine R.S. Prussia examples. The mark on this piece is too thick and contains too much red when compared to an authentic R.S. Prussia mark, but it might fool a novice collector. However, examining the piece in total one can conclude that it is a reproduction, especially when compared to an authentic piece of this fine porcelain. This hatpin holder has been widely reproduced. See below for more information. The quality is off on this piece compared to genuine R.S. Prussia hatpin holders. It is heavier in weight, and far less delicate in terms of the mold shape and decorative techniques used (in this instance transfer designs that have a "new" look to them). It is also marked with a bogus mark: R.S. over a green wreath without the word Prussia below. This mark is used on many different R.S. Prussia reproductions. Technically this could be deemed a fake because it doesn't clearly mimic an authentic R.S. Prussia item. Most collectors and dealers refer to these pieces as reproductions nonetheless.